The King's Pool Camp in the northern parts of Botswana overlooks the oxbow-shaped Kings Pool Lagoon and the Linyanti River to the north. The reserve consists of 125,000 hectares of unspoiled wilderness. Most of the area is characterized by open grassland, riverine forest, mixed terminalia woodland and the dry Savuti Channel. King's Pool is most famous for its very large Elephant populations, which during the winter months, can reach enormous densities. Impala, Lechwe, Kudu, Zebra, Giraffe, Sitatunga, Sable, Roan, Waterbuck, Buffalo, Bushbuck and the smaller antelope are all sighted here.The major predators, such as Lion, Leopard, Cheetah, Wild Dog and Hyena are all residents of this area. The reed and papyrus swamps are idyllic for a number of diverse species, ranging from the Fish Eagle to waterfowl, cranes, storks, plovers and herons.One of the camp's highlights are the sounds of the animals: The chorus of bird song in the early morning. Hippos grunt and snort all day, Baboons bark and screech, Elephants wander through the camp and trumpet, and Lions sometimes roar around the campsite during the night. The accommodation in the King's Pool camp consists of 10 luxury tented rooms with en-suite facilities which are possibly the best selected bath rooms in Botswana. Each room is built on a raised teak deck with wonderful views onto Kings Pool Lagoon.The tents have been designed to ensure that each guest is totally comfortable and private, while at the same time offering all the atmosphere of a tented camp in Africa. There is one honeymoon suite which is under thatch.Each en-suite bathroom has a wonderful view overlooking the Kings Pool Lagoon. They are tiled and have showers, toilets and hand basins. Soaps, shampoos and insect repellents are supplied in each room. 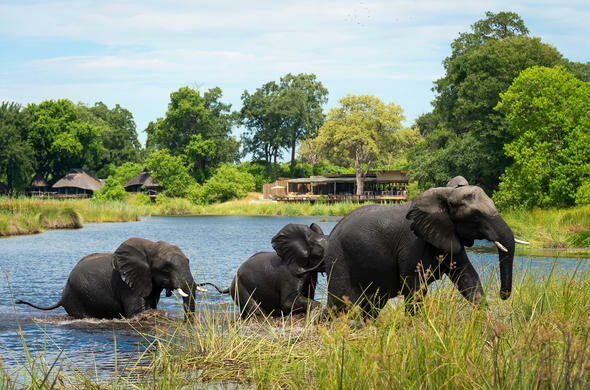 Kings Pool Camp is located in a private reserve in the Linyanti / Savuti Channel area in the northern part of Botswana, on the western boundary of Chobe National Park.